Now that the winter has melted into spring, it means blossoming trees, flowering plants and sudden downpours of rain. That’s right, March, April and May make up the British rainy season, meaning you can expect more frequent showers all over the country. 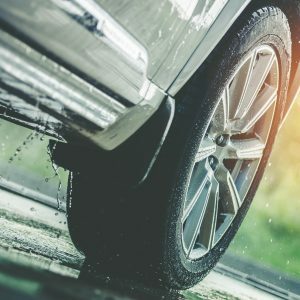 With rain comes more dangerous roads, so there is no better time to brush up on your driving techniques and read some advice about how to stay safe on the roads this spring. The general advice is to avoid driving in heavy rain if possible, but if circumstances mean you must get in your car and drive, here is a list of some of the things you should be doing to keep you and your passengers safe. Windshield wipers – Before you set off, you should make sure that your windshield wipers are working properly. You don’t want to be caught in the rain with wipers that can’t clean your windshield. So, make sure yours are functional and clean, so they’ll do their job when you need them. Headlights – Another essential part of your vehicle, particularly in rainy weather, is your headlights. Your headlights must be working so that drivers can see you in the rain when there is low visibility. Tyres – When driving in rain, or driving at all, your tyres are incredibly important. They are the only thing between your car and the road and play a huge part in how quickly your car is able to brake, especially in wet weather. Having high-quality tyres from trusted brands like Bridgestone means your tyres will have quality grip performance, meaning the tyres can disperse water efficiently, helping you to brake. Check that your tyre tread depth is above 1.6mm, but remember, just because a tyre tread depth is legal it does not mean it is safe. Tyre tread depths of 3mm or higher perform much better in rain, compared to the legal limit. The air pressure of your tyres also effects how easy is it for your car to break in wet weather because underinflation is a major contributor to aquaplaning. So, checking your tyres have the correct amount of pressure before driving in the rain is essential for safety. As well as ensuring that your equipment is working well, there are also numerous driving techniques you should adopt to make your driving safer in the rain. Most people drive simply out of habit, and they don’t think about adjusting their thinking and staying alert when weather conditions are more severe. Following some of these tips will help you to change that. Keep a Safe Distance – When driving, you should always keep a safe distance between yourself and the car in front of you, roughly two car lengths is recommended. But, when it’s raining, keeping a safe distance is all the more important because your stopping distance is severely affected in wet weather. Avoid Heavy Braking – Heavy breaking is widely known as one of the biggest causes of aquaplaning. So, when you’re driving in rain, it is important to ensure you brake within plenty of time so that you avoid braking too heavily. Learn About Aquaplaning – Should you find that your car does aquaplane, you will want to know what to do. You can do everything in your power to avoid aquaplaning in the first place, but being aware of all of the safety techniques for dealing with it if it does occur, may save yourself from an accident. To recap a little, aquaplaning is when a layer of water builds up between your tyres and the road. This means the tyre cannot grip the road, causing lack of traction and control of the vehicle. Signs that your vehicle is aquaplaning are your engine becoming louder, the steering feeling light or the back end of the car drifting. The important thing to remember when this happens is to not panic. All you can do is ease off the accelerator, straighten the steering wheel and don’t hit the brakes hard. Also, don’t forget, your tyres will play an important part in whether your vehicle can resist aquaplaning. Slow Down – Watching your speed in wet conditions will help you to avoid aquaplaning and any road accidents. It is important to be more cautious in wet conditions because it will affect how your car grips the road. Consider Other Drivers – When you’re driving it is always important to consider the drivers around you, but this is even more important when weather conditions make accidents more likely. Grip the Wheel – When you get used to driving, it is easy to let bad habits creep in. But weather conditions that make the roads more dangerous should remind you to adopt best practises such as gripping the wheel in the ten to two position. Avoid Puddles – Driving too fast through deep water can cause serious damage to your vehicle. Not to mention that splashing pedestrians by driving through a puddle can result in a fine. This is why it is best to avoid driving through puddles all together if possible. There are many techniques and tips you can adopt to ensure you’re driving as safely as you can in the rain. But, what plays a huge part in your ability to drive safely is your tyres. At Asda Tyres, you can get premium tyres such as the Bridgestone range for low, Asda prices, should you need to replace yours in preparation for the rainy season.